A new diffraction glasses era has begun….experience a world of 3DIFFRACTION. Words and pictures do not properly explain the phenomenal effect created by these glasses. You must try these glasses in person to truly believe. The combination of 3D lenses paired with diffraction has set a whole new standard in visual entertainment. When folded down, the magenta and emerald lenses cloaked in pure light diffraction creates a stellar holographic-3D-prism effect. 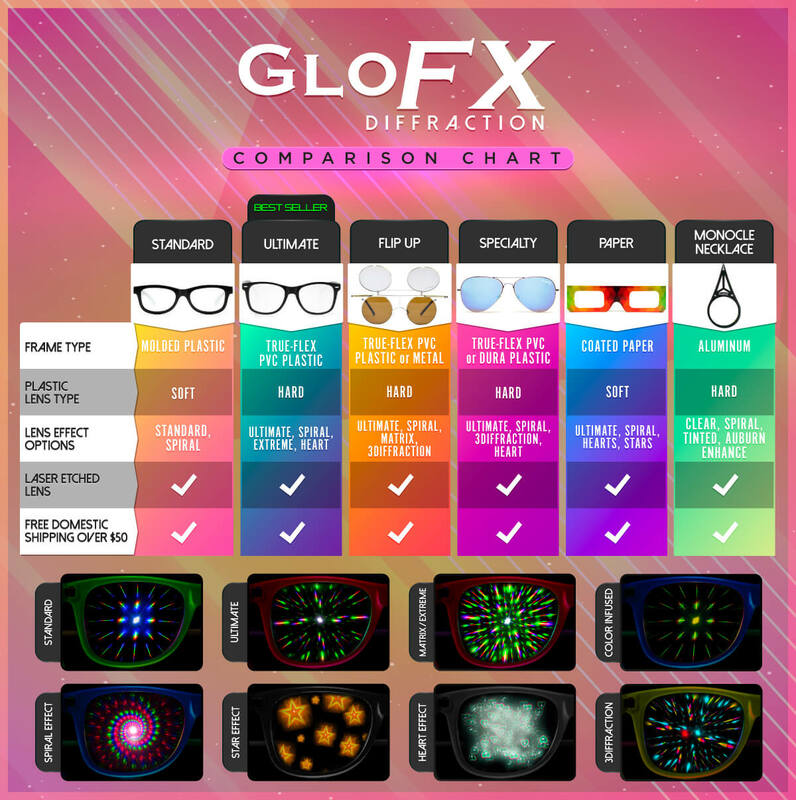 If you’re looking for glasses that are as innovative and bold as you are, look no further than GloFX 3Diffraction Glasses. These glasses add depth and dimension to your diffraction experience. Aside from their perfect enhancement of light projection screens, event light shows, and laser projections, these glasses have proven to be an all time favorite in the LED glove, orbit, and poi communities. By incorporating a mind bending 3D effect, these glasses truly enhance LED lights to the max. LED glovers cant stop talking, poi spinners are nearly falling over, and orbiters can’t get their hands off these glasses. With a 100% exclusive GloFX design, these glasses offer superior quality and durability unmatched in other products. Your vision will not only be stimulated with a true prism of light diffraction but will also be heightened with our 3D amplifying lenses. Our revolutionary designs will blow your mind time and time again. Grab a pair today! So awesome! I’ve taken these to multiple music festivals and they have been tons of fun! The lights diffract perfectly and the colors were insane. The 3D effect makes these even more crazy. I highly recommend these and the flip option is great! These are my favorite glasses to bring to any concert! Stage lights and most LED walls react well with the 3D lenses and make the patterns and images really pop out. The diffraction lens duplicate those images with added hue. Bassnectar is a must see with these!! 3Diffraction is my favorite type of diffraction glass, and I’ve never come across a successful imitation. The magenta/cyan combo makes the whole world look like a holographic pokemon card. With the lenses up, they don’t obstruct your vision in any way. I’m a huge fan of these and recommend these to anyone over other styles.